Freebyte Task Scheduler is a useful and very user-friendly Windows application that allows you to start other installed applications automatically, be it periodically or at predefined times. More about its interface, usage and installation right after the jump. 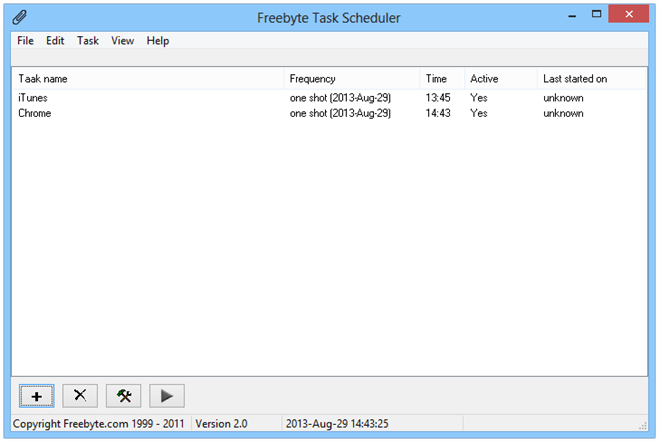 Thanks to its portable nature, Freebyte Task Scheduler doesn’t even required to be installed on your computer. Just extract its portable EXE file from the downloaded ZIP archive, and start using it. Upon launch, you will see that the app sports a barebones UI and doesn’t feature any complicated settings to confuse you. Its functionality is also pretty straightforward; simply schedule programs to launch on their own based on your set frequency and time, and you can do it all with just a few clicks. Once you launch the application, you see blank space all around, which fills up as you keep adding new tasks to the list. The application then displays the task name, frequency of occurrence, time at which the task will trigger, activity state, and last started time for each of them. The bottom part of the UI carries a row of icons for adding a new task as well as deleting, modifying or executing the selected task. To add a new task to the list, click the + button from the bottom bar. You are then presented with a new window titled ‘Define new task’, where you need to enter a few details. Go ahead and choose when the task should be executed (once at a specific date, daily or weekly). If it is a certain date, then you also need to define the exact date; similarly, for weekly execution, select the day(s) of the week on which you want it to run. After that, select its starting time. Next, you need to enter a name for the task, specify the program’s location (path), and enter any optional parameter for it if you need. For instance, if you want Google Chrome to be launched, simply select its EXE file as the program location. Once done, click Save to add it your list, and the Freebyte Task Scheduler will do the rest.